Once upon a time there were two crazy kids, one of whom loved sweet potatoes. They laughed, played, and enjoyed each others company to the full extent allowed by a Korean variety show. Then they were pulled apart, left to drift in their individual success, overflowing adoration, and stable lives. The shame! The reason I was sucked into We Got Married in the first place rests largely on the Kpop perfect shoulders of YongSeo couple. I had heard of the show, read about the show, asked myself if I really could watch the show (I have to admit it, the premise is a little weak upon introduction) and then took the plunge. And was I ever hooked. And hooked by this couple- I watched, and watched, and watched. Hell, I still re-watch these two when I am bored. The elements that have always drawn me to WGM are the awkward exchanges and possible outcomes and this couple served up plenty of both. In real life Yong Hwa is the successful leader of CN Blue (and a talented songwriter) while Seo Hyun is the ever fresh faced Maknae of SNSD. When paired together the two created a variety character couple that is second only to my favorite K-variety pairing, Running Man’s Monday Couple. Prior to their first meeting Seo Hyun chose code words that would only be understood by her and her unnies. If she liked her new “husband” she would mention her favorite food sweet potatoes (goguma in Korean), if she did not fancy him she would say hamburger (one of her least favorite foods). WGM fans rejoiced when she dropped the phrase sweet potatoes and from that moment on the couple had a name- Goguma. As the show progressed Yong Hwa gave his variety character a good dose of the caring husband while Seo Hyun consistently displayed a knack for fresh faced innocence. The pairing was golden together; they shyly played out a romance (that while not real) is better than many a Korean drama love story (and much less tragedy filled). The pair wore couple rings in their public performances, sang together, and genuinely seemed to get along swimmingly. I will admit it, my heart jumped at the couple rings displayed so openly. Whether that makes me a hopeful freak or not I do not care- my desire is not to see this duo get together in real life but to enjoy their perfect fake marriage. Wow does that sound delusional. Insanity aside have you heard the Banmal song?! Freaking adorable! Speaking of (um, I mean typing of) Banmal Song the Sweet Potato couple released a song that detailed Seo Hyun’s struggles with speaking Banmal (informal speech) with Yong Hwa. The song showcases a Seo Hyun talent that began with We Got Married- her guitar playing. The couple play acoustic guitar and sing to awesome affect. In my opinion the best goguma couple moment occurred when Yong Hwa gave every guy a reason to hang their head in annoyance-he bought Seohyun a portion of a sweet potato field for her birthday (after writing a heartfelt letter to her Mom, no less). To cap off this couple’s birthday celebration Seo Hyun sang one of Yong Hwa’s songs to him, only to be told that he had written it about her….sorry, I just died inside. Recovering, recovering. One moment. Okay, partially recovered. 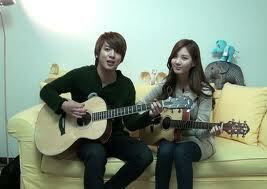 In conclusion, the YongSeo couple was a variety pairing that did exactly what they were supposed to do and more. While not an actual couple they interacted in a way that made viewers believe in their relationship, all while laughing and giggling with delight. For that I salute the Goguma Couple. Sweet Potato Cheers!